The 10-20-30 minute secrets to tone up your body! Getting up in the morning and putting in 8 hours of work at office sitting before a computer on a chair has become customary for most us on weekdays. Yes, we do have pit stops in between for a heavy breakfast/meal, sometimes for no apparent reason other than being so yummy. And eventually, it’s time to go home and hit the bed. It appears as if we are logging hour after idle hour with our bums glued to our seats one-way or the other. This mechanical, sedentary lifestyle coupled with inadequate conditioning is no doubt putting us at obvious health risks. Fitness has more to do with the lifestyle than the work that we are subjected to. Any exercise is better than none. Being caught up at work all day cannot be the reason for skipping exercise. There are quite a few simple and effective ways where you can burn a few calories even within an office environment. Let’s turn the office into a place where you get your exercise groove on and not feel embarrassed, ashamed, or inappropriate. High-intensity interval training (HIIT) is one of the best ways to maximize your workout time. 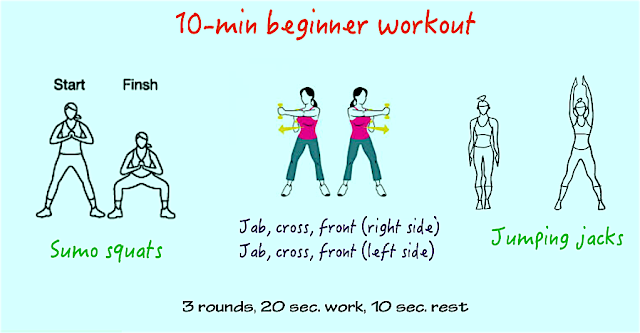 It is super-efficient and is the ideal workout for a busy schedule. Most importantly, you don't need any special equipment to get it done. You can do this in your office, at home while watching TV – almost ANYWHERE! Research shows you can achieve more in a mere 15 minutes of interval training (done three times a week) than a girl jogging on the treadmill for an hour. It helps you ease the stresses of work, improves cardiovascular fitness, build lean muscle & drop fat, increases metabolism, reduce your perception of pain, allows you sleep more deeply, and keep you rejuvenated. 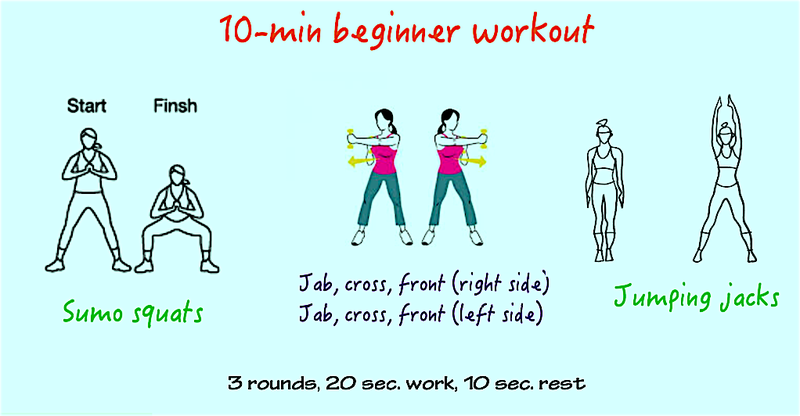 Complete 3 sets with 20 seconds of work and 10 seconds of rest between each move. Jab, cross, front (left side): Repeat the above on the opposite side. Try to do as many reps as possible during each 45-second interval, then rest for 15 seconds. Complete three rounds, with a one-minute recovery between rounds. Pushups: If you can't complete a traditional pushup, place your hands on a stable chair or plyo box instead of the floor. Or, try doing pushups with your knees resting on the ground. Try to do as many reps as possible during each 45-second interval, then rest for 15 seconds. Complete three rounds, with a one-minute recovery between rounds. See above for exercise descriptions. So, maximise the intervals and get on with it. "Motivation is what gets you started and habit is what keeps you going!"